The San Cristobal La Fuerza is a very good option for a mild and creamy cigar. • Enjoyable even in its young age. Very smooth, with a creamy and molasses core. • Rich flavors of toast and coffee, with also some spices. This cigar simply is a nice mild cigar that is a perfect morning smoke. It is a beautiful cigar with an unusual size, called Gordito. It is looking great, perfectly rolled, with a nice dark and oily wrapper. Very few veins are there, but there are absolutely no soft spots or lumps on the cigar. Once cut, the draw is good, not too loose, not too tight. The cold draw reveals rich tobacco, some wood and lots of spices on the lips and through the nose. There are also some hints of sweetness (caramel, sugar, and coffee). Once lit, the cigar releases generous billows of white smoke. The burn is good as well. The first third of the cigar is medium bodied, but full of flavors. The dominant flavors are of cedar, burnt toast (in a good way), and fresh tobacco. Here and there, some floral and sweet hints and some earthy tones. The spice builds up during the first third and towards the end of the first third, the white pepper flavors get pretty strong on the lips and on the tongue. Overall, the first third is creamy and not overpowering. In the middle third, the cigar mellows down a bit, while the dominant flavors are still of toast, coupled with some coffee, caramel flavors, and with some hints of mint and coconut. 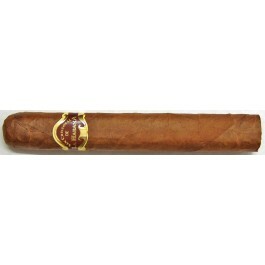 The cigar is sligthly less creamy, the finish is dry and clean. The cigar burns very well, the burn line is neat and the dark grey ash holds on firm until the band. In the final third, the flavor profile remains similar, with the toasty flavors evolving towards a charcoal taste that does not last, leaving more space for a creamy caramel flavor. The spices also ramp up, the white pepper is pretty strong towards the end. There are also some hints of paprika and of coffee. The finish is long and spicy once again and remains with you even after putting down the cigar. In summary, it is a mild and interesting cigar with rich coffee and toast flavors.